Have you ever been on one of these? Have you ever been spun around so fast that you've eventually just fallen off because you were unable to hold on any longer? Have you ever felt nauseous while being spun around at a million miles per hour? Kerry-Anne loves spinning things. She loves things that make ordinary people nauseous. It's almost as though someone removed her inner-ear so that she's impervious to that which makes many (i.e. me) turn green. We have several play-parks close to our house, so kids don't have to go far to play. 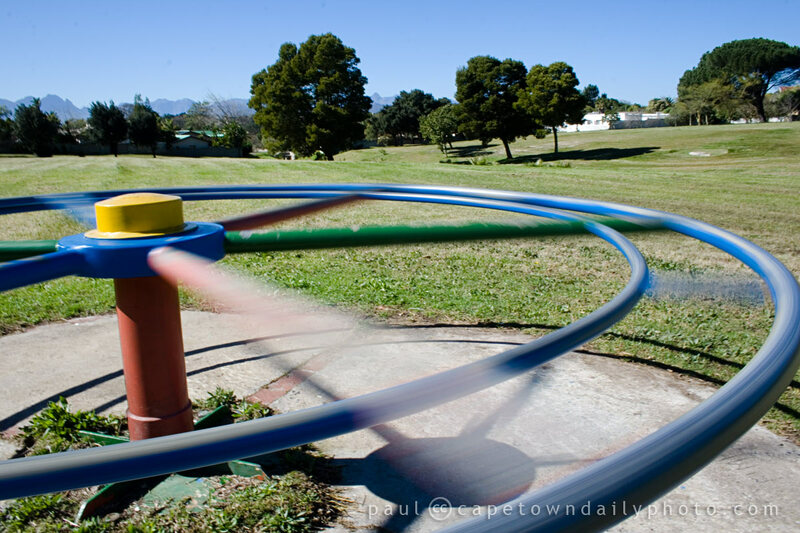 Sadly, the days of allowing your young kids to play alone in these parks are kinda over, so it's actually seldom that we see kids playing on these. I guess kids today spend time playing on their Wii or XBox... which (I think) is sad. I hold a lot of memories of playing outside, doing all kinds of weird things away from home. I can't imagine that the kids of today would in years to come have memories of a particularly difficult XBox game that they cracked, or a particularly tricky level that they achieved on the Wii. Posted in Activities and tagged leisure on Thursday, 27 August, 2009 by Paul. Yes I’ve been on one of those. In fact, I’ve been on that specific one. I’m not sure of blaming console games is entirely fair, in my experience it’s the kids who play lots of console games who tend to also be active outdoors. I think TV is still the bigger lazy-maker. When I was in school, I remember parents buying other kids consoles or getting DSTV so that the kids stay at home more, because they’re afraid of crime (or drugs/alcahol, etc) and they don’t want their kids to go out. I think parents also play their part. That’s why we’re becomming just as fat as a people as America. At least it’s spring now. Yay.